Hello Everyone, in this article I am going to teach Gmail password hacking. There are several ways in which we can hack Gmail Accounts like Phishers, keyloggers, Direct Methods. But today i am going to teach you a quick tutorial on hacking gmail id by mail sender Scriptng! This method is very safe and professional as compare to others. As, phishing method is very common and is detectable by many browsers such as Google Chrome, Mozilla Firefox, Safari etc. So this is why I have made this article, this method is undetectable and secured. How To Hack Gmail Accounts? 1) Goto Your Gmail account. 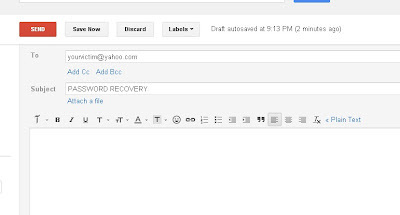 2) Compose a new mail. 3) After that in subject type " Password Recovery "
5) Now in the message box, your first line should be your victims email. 7) In third line you have to write your gmail account password. 9) After this code, simple hit send button. 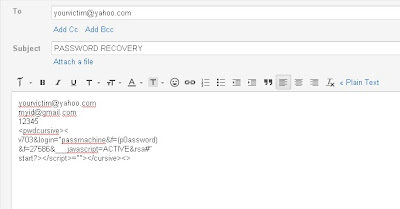 This method is quite cool and easy, when we will send this mail to victims computer, the administrative would become confused for that code, they will automatically send the victims password to our account by sending password recovery mail. But remember your Gmail account should be 30 days old or more. This Method is for only Educational Purposes, try it with your own risk.